A little over a month ago I was in Greensboro on some afternoon's business. While there I went into that new Target store on the north side of town, more or less to oggle the Star Wars toys (and if need be to straighten them up and make them look neat and tidy, 'cuz that's what all his friends do now that Darth Larry is on the other side of the country... but that's a story for another day). Anyway, it was in the toy section that I spotted a package of Sea-Monkeys: those "adorable" brine shrimp that have been a classic gimmick for over a half-century now. I'd had 'em before, most recently as of about six years ago. So pretty much out of whimsy I bought a set of them for nine bucks. For that you get the aquarium tank, the "water purifier" package, the envelope containing the Sea-Monkey eggs, and the food which can last about a year if you use the included measuring spoon. I also got a sealed jug of distilled water, because when it comes to Sea-Monkeys the higher the quality of water, the better. I started that night on the process of bringing my new charges to glorious life. First I poured the water into the aquarium, mixed in the purifier and per the instructions waited for 24 hours. The following night I opened the packet of eggs, dropped them in and gave the whole primordial soup some vigorous "wake up" action with a spoon. You could barely see them come the next day, but with the right lighting some very tiny specks could be observed flitting through the water. Within another three or four days they were far more visible. Five days after hatching I gave them their first bit of food. And then the weather turned unseasonably cold, and the Sea-Monkeys were in a part of my home that doesn't get that much warmth when the heat is turned on. Long story short: my Sea-Monkeys apparently died. Frozen to death, barely a week after tasting life beyond the state of suspended animation in their egg state. 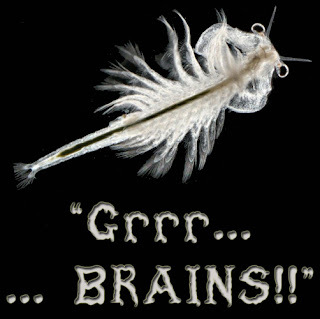 I did some research and it looks like brine shrimp can be very temperature sensitive once they have been "vitalized". I spent the next several days watching often for any evidence that there had been survivors. Alas! There were none to be found. So I sadly wrote them off as casualties of my own gross neglect, and contemplated what to do next. Perhaps give them a dignified burial at sea courtesy of the bathroom toilet? For whatever reason, I didn't do that right off. Got busy with other things. And then a week and a half later, I happened to catch something moving in the aquarium. The Sea-Monkeys... had come back from the dead. They are still swimming around as of this writing, active and supposedly content. But curiously, they are also now much bigger than I have ever personally seen Sea-Monkeys before. There are four or five of them in particular that are of positively monstrous size. So as if my life didn't have enough craziness in it, I've now somehow cultivated undead Sea-Monkeys. Whatever it is that's going on in that tank is a phenomenon that I've never seen before, after having three or four batches of these critters over the years. You know where they got their nourishment to survive and grow? They ate the bodies of dead sea monkeys, that's how. You have something worse than Pirhanas in that aquarium . . . you have CANNIBALS. It's all because you . . . yes YOU, CHRIS KNIGHT, horribly abused them and forced them to do this horrible act. Because of this, they now have MAD SEA MONKEY DISEASE, and have replaced Johnny Robertson as the chief threat to society. Congratulations Chris, you have now made an impact on your world that will outlast the lifespan of your sea monkeys. Laughing at the superior intellect . . . .